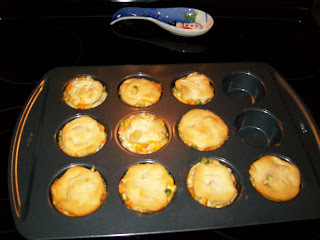 Frugal & Fabulous: Frugal Recipe - Mini Chicken Pot Pies! Frugal Recipe - Mini Chicken Pot Pies! 1. Cook the peas and carrots according to the package directions; drain well. 2. Combine the peas, carrots, chicken, Cheddar, cream cheese, onion, mayonnaise, salt, black pepper and garlic powder in a large bowl and mix well. 3. Preheat the oven to 325'F. Separate the biscuits into halves. 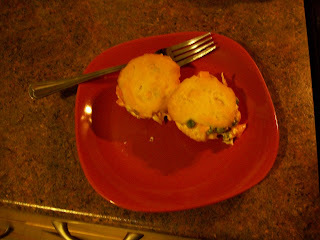 Press the bottom half of each biscuit into each of 10 muffin cups. 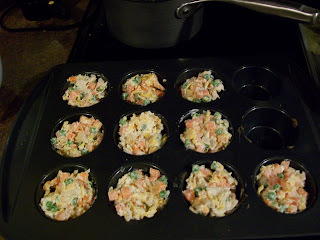 Spoon equal portions of the chicken mixture into the prepared muffin cups. Cover with the top halves of the biscuits. Press the edges to seal. Bake until golden brown, 25 to 30 minutes. Recipe from Couponing 101 ! DH and I both loved this recipe. (*9 out of 10 DH RATING!) Next time I'll double it and make a side of mashed potatoes (the one thing it was missing!) We were too excited about the finished product to make anything else. I have a feeling we'll be fighting over these leftovers! :) This would be a good food for kids - and an awesome appetizer for a party! They look so fun to make... and to eat! Thanks for sharing the recipe. Hi Lindsay! I'm glad you liked the pot pies! It's one of my favorite recipes - cheap, easy, and yummy! Your pot pies came out so cute! Mine are always oozing filling, lol.